It's Halloween and party time, here is a quick list of party foods, that will make your table perfect for your guests to get them in the spirit of Halloween. These are just some ideas and guidelines. 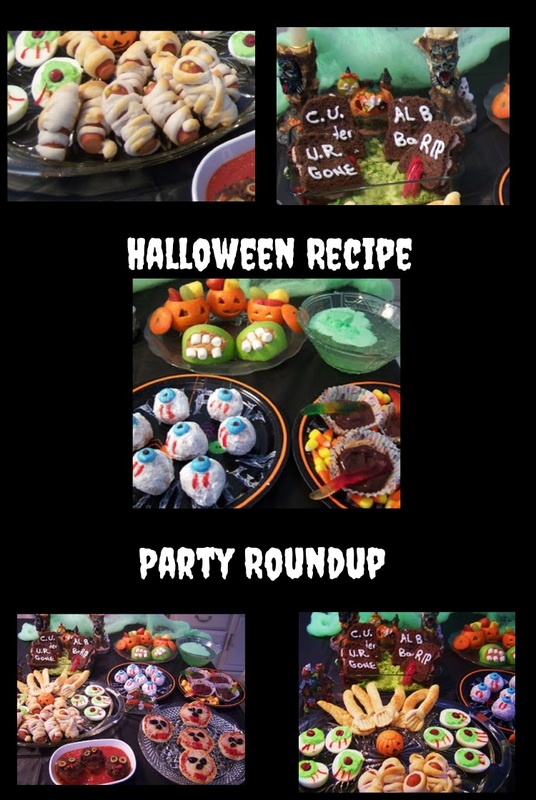 I am sure you can think up many spooky foods to create! Gravestone sandwiches, tangerine pumpkin fruit cups, apple peanut butter teeth, witches brew, mummy hotdogs, deviled egg eyeballs, donut eyeballs, dirt pies with worms, meatballs swimming in sauce faces, and English muffin faces. A fun time of year for me. Growing up it was always so cold by October to go trick or treating. Regardless of rain,sleet or snow, two pairs of pants, two pairs of socks, two sweaters, a coat, boots and hat would save the day. Nothing would stop me from going trick or treating. I can remember at eight years old, walking down the street in East Utica, NY, 700 block of Lansing Street to be exact, with my all my friends and the snow and wind would be blowing in my face I could hardly see the doorbell to ring. Eyes were tearing from the snowflakes and winds, but all worth that one box of crackerjacks, or full size candy bar, we waited for all year to get. We always had out favorite house to stop at, and knew who gave out the "good stuff". Never had a worry in the world about the things back in those good ole days, unfortunately its a little different now and we can't be too careful protecting our children. So these memories live on and we now can look forward to safe Halloweens in our homes. For the children the grandchildren and all the grownup kids in the world, I dedicate this post. Hope you all take away something you like, they are all easy and fun to do.. Enjoy!!! and Happy Halloween to everyone !!!!!! Entrance set ups are huge, scary spider webs are the best and using fishing line to dangle spiders, bats and other creepy rubber items. I am a big fan of pirates, so my theme is to have my entrance set up with pirates everywhere. Of course I have a pirate that electronically makes scary noises when you walk by or is voice activated. Hot dogs wrapped in strips of refrigerator dough,leave part of the top exposed for the face and bake... these at 400 till don't overcook. When cool, dot eyes with mustard drops, these are always a hit . Powdered donuts holes using blue frosting for the base of the eyeball and chocolate chip center for an eyeball, making red lines with piping gel for veins. Two slices of green apples, Core the apple and cut into fourths. Cut a small wedge on the skin side of the apple. Brush with lemon juice or keep them soaking until your done, so they won't get brown. Fill with peanut butter or my favorite, Nutella! then add mini marshmallows for teeth and squeeze together. Make or buy chocolate cookies. Make a thin batch of white frosting, and using a fork, dip it in the frosting and make slashes of frosting in different directions on the cookies, add black piping or orange in center to look like spiders. Serve fried meatballs on a plate swimming in sauce. On each center of the meatball, slice large pieces of green olive and place a solid piece of black olive in the center of the green for eyes they will stick on if you use a little grape jelly or honey as glue. Use pieces of dark sandwich bread, like wheat or pumpernickel and cut the crusts off .Cut out shape of grave stones with a sharp knife. Fill with egg salad, tuna salad or ham salad. Use mustard or mayo, ketchup with a nozzle to write scripts on the tops bread such as RIP, Lon Gone, Cross and Skull, Al B Back, C. U. Later etc.You can arrange in a bed of shredded lettuce to stand up. Boil several eggs, take out the yolks add to a bowl, use a few drops of green food coloring add enough mayonnaise to make it easy to fill them back up. Add slices of black olives to the middle and the piece of red pepper for the center. On the long part of the white of the egg, make red streaks using ketsup from a nozzle tip. Lime sherbet floating in a bowl of Lemon Lime Soda. Take English muffins, toast them fist. Add sauce mozzarella and broil just till melted. Make eyes out of black olives sliced, pepperoni centers. Slices of red pepper for the mouth. Use Oreo cookies crust for filling the bottom of mini muffin tins lined with Halloween or orange paper liners. Fill with chocolate pudding and add a gummy worm cut in half to each. Other option is to make boxed brownie mix into paper liners, when cool melt chocolate on top. You can add the gummy worms to those also or leave plain. Slice off the top of the orange and scoop out orange as you would a pumpkin.Cut out a face as you would a jack o lantern. Fill back up with fruit salad, making sure the fruit is popping out of the eyes. What a great list! I look forward to more! I love Halloween! Since I am a teacher I plan on making devil cupcakes. Thanks for the list! It can be such fun with all these "gross" or "scary" foods! Your treats are GREAT for getting folks into the mood!!!!!!!!!!!!!! I'm especially looking forward to the day. @nicole oh those sound great! @honeyb wow what a small world! @vanilla and thyme thank you! @kokopelli's Kitchen very glad you are getting in the spirit! thank you! Wow, I love these ideas! Happy Holloween! Oh, those are great, very artistic. Happy Halloween! Bdw, if you have time please stop by my site I have a couple of awards for you. Great ideas. Halloween is probably the most fun holiday! Super cute ideas! I love this time of year cuz of the creativity all around! Claudia, you're fantastic! You did all those food. Oh my, you're so talented. And your Halloween decorations look a kind of cute. Happy Halloween to you & your family and have lots of fun. Cheers. It is really cute n scary.